Portugal. Home of port wine, right? Yes, but also home to many beautiful table wines as well. Master Sommelier Eric Entrikin from California recently presented an array of samples from Wines of Tejo at the beautiful Sepia Restaurant private dining space. Entrikin said that even though grapes indigenous to Portugal have very different names from the ones most Americans are familiar with, they possess categorical similarities. He explained how, during his formal training as a sommelier, he had to learn to taste all over again. He learned to sense and taste similarities between types of wines that are made from different grapes yet have distinct features in common. For example, Alvarinho grapes from Portugal produce wines with similarities to those made from Albariño grapes from Spain and to some wines made with Chardonnay grapes. Aragones grapes in Portugal are known as Tempranillo in Spain and produce wines that might compare to some of those made from Pinot Noir grapes. The white wines presented were exceptional in flavor and remarkably value priced, most ranging from ~$9.99 a bottle to $13.99. Sepia chefs did an admirable job pairing dishes with these lovely wines. 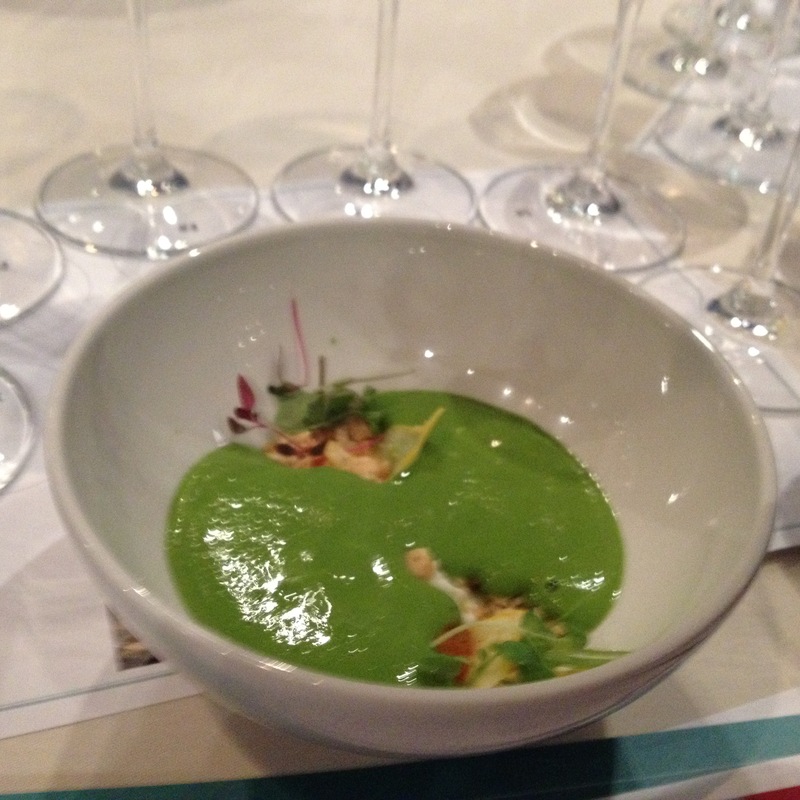 For example, with the first course of super-creamy, zucchini-fresh-basil gazpacho studded with burrata and garnished with Marcona almonds, three very different types of dry white wines each complemented the dish in a uniquely enjoyable way. Favorite white wines included the complex but beautifully balanced Quinta da Ribeirinha 2014 Vale de Lobos Branco–an incredible value at ~$10.99–and the Quinta da Aloma 2014 Arinto VR Tejo–bright and crisp and delightful in a multitude of ways (think Sauvignon Blanc without as much minerality) and well worth its ~$9.99 price tag. I kept going back to taste this one because I felt like I discovered something new with each taste. 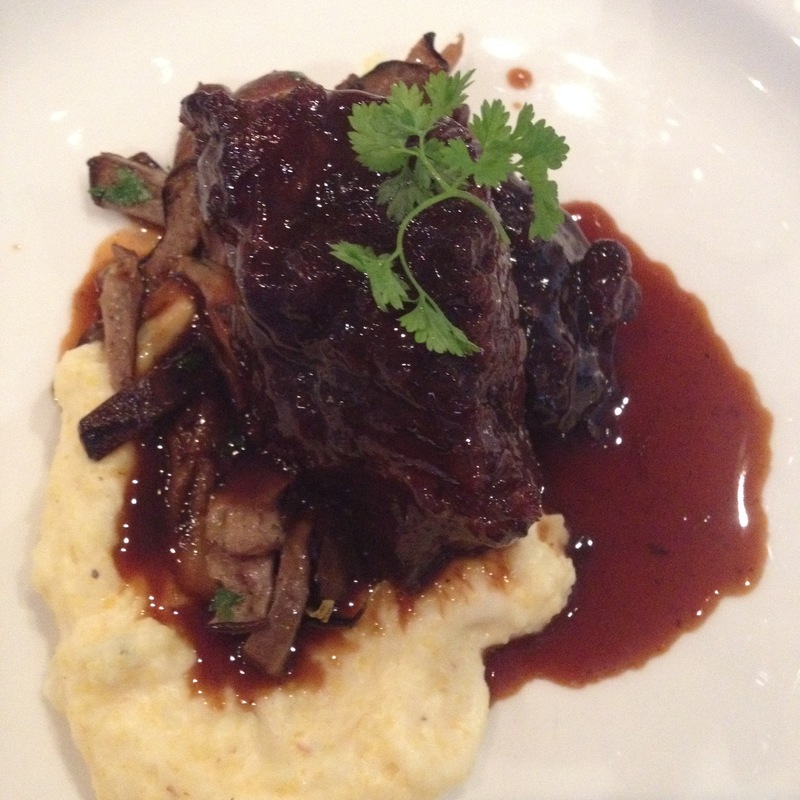 Several rich red wines were selected to accompany a red-wine-braised pork cheek (bearing some resemblance to a chunk of braised beef) that was served artfully with a smoked mushroom escabeche atop a smear of creamy polenta and garnished with tiny sprigs of fresh herb. Notable values among the reds included Casal Branco 2012 Quinta do Casal Branco Tinto (~$10.99) and Adega Cooperativa do Cartaxo 2012 Bidao Classico Tinto (~$8.99). The imaginative food items paired so well with the delightful, delicious Wines of Tejo–and served in such lovely surroundings–that this was an occasion to remember. Visit Sepia soon, and talk to your favorite wine merchant to seek out some of these exceptional Portuguese values. You will not regret it. Read more about some of the luscious wines from another region of Portugal, the Duoro River Valley.